elementaryOS 5.0 DVD (64-bit) | Linux DVD Shop - UK Linux Shop supplying Linux on CD, DVD and USB with Free UK Delivery, 24Hr Dispatch. elementaryOS is a lightweight Linux distribution suitable for old and new computers that comes with a beautiful Mac OS X style interface. 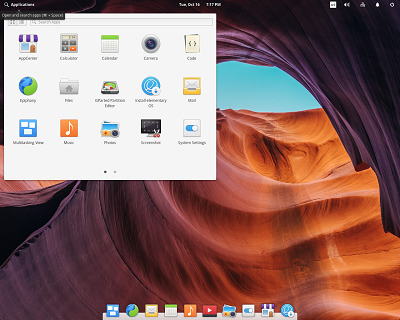 elementaryOS is based on Ubuntu and the DVD can be run Live or can be fully installed. elementary comes with an excellent suite of custom tailored apps that let you get right into doing the things you love. Easily surf the web, check your email, listen to music, and tackle everyday tasks or pleasures. This is a great operating system choice for users coming from Microsoft or Apple with its style, simplicity and performance. Perfect for netbooks or laptop or PC just for browsing, surfing the web and chilling to some music.